Escalated costs of improved water and wastewater treatment: More stringent standards and regulations as well as increased use have drastically increased the cost of treatment. The BioCAST system can also be used as an add-on technology to the existing treatment installations for an upgrade or a retrofit, increasing their capacity while upgrading them to meet strict environmental regulations. BioCAST-TER combines high-rate biological treatment with efficient solid-liquid separation for the removal of organic carbonaceous compounds and inorganic nutrients, i.e. nitrogen and phosphorus contaminants from wastewater, contaminated groundwater and landfill leachates. The treatment system produces a clear and well-treated effluent which conforms to tertiary environmental standards. This technology uses two separate but interlinked reactors containing four different zones with environmental conditions of aerobic, microaerophilic, anoxic and anaerobic for biological treatment, as well as two sedimentation zones and a filtration unit for efficient separation of solids from liquid. The presence of four biological zones with different environmental conditions and the underlying interactions between these zones support the growth and proliferation of a diversified group of microorganisms, and ensure high efficiency removal of different types of contaminating compounds that require a variety of environmental conditions and a diversity of microbial population for their complete removal as well as the digestion of decayed microorganisms. BioCAST-TER contains microorganisms in both suspended and immobilized forms, thus increasing the biomass concentration and microbial retention capacity of the system. This will in turn produce a high mean cell residence time (MCRT) or sludge retention time (SRT) and an elevated sludge age, important factors that increase the efficiency of treatment and improve contaminant removal capacity of wastewater treatment systems. The increased concentration and residence time of biomass will produce high volumetric and specific removal rates of contaminants while enhancing the tolerance of treatment system to biological upset and toxic shocks. In addition, the hydraulic retention time (HRT) will be decoupled from the sludge retention time, thus providing flexibility to deal with varying wastewater flow rates. 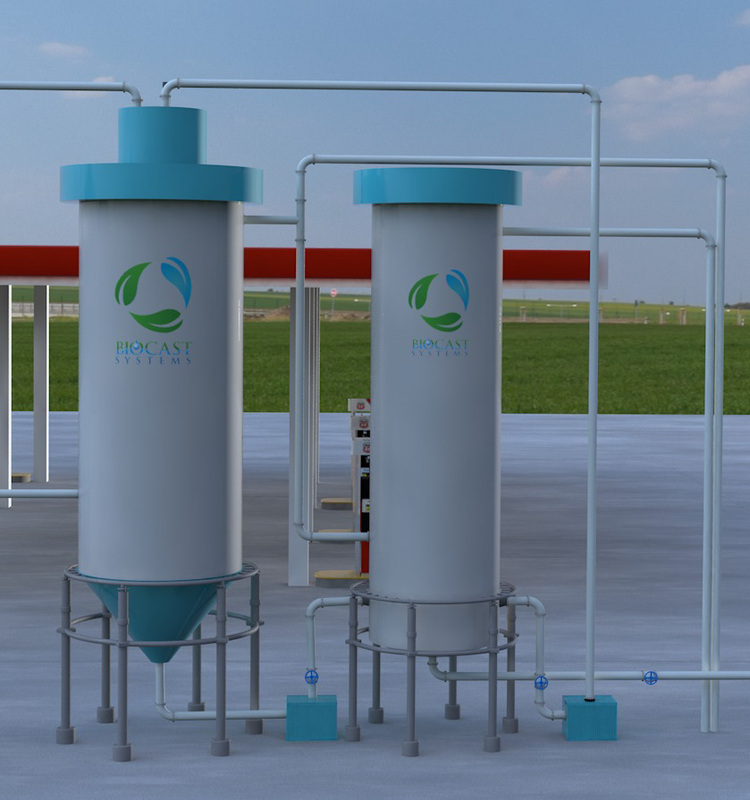 As a unique feature of the technology, BioCAST-TER generates considerably less biological solids or sludge compared to the conventional aerobic suspended-growth technologies, resulting in substantial reductions in the associated costs of solid handling and disposal. The small amounts of solid material produced during the treatment process are effectively separated from liquid in three clarification zones. The optimized operation of a multiplicity of biological processes, combined with the presence of both suspended and immobilized biomass enables this treatment technology to achieve very high conversion capacities and high removal efficiencies of both organic and inorganic contaminants compared to conventional treatment systems. The results of pilot-scale operations demonstrated that the BioCAST-TER treatment system has the capacity for effective removal of carbonaceous contaminants and considerable reductions in the concentrations of nitrogenous and phosphorus compounds. Removal efficiencies up to 98.9% for carbonaceous compounds, 98.3% for total nitrogen and 98.0% for total phosphorus were achieved during 310 days of treatment of a wastewater that contained COD, total nitrogen (TN) and total phosphorus (TP) concentrations in the range of 1,300-4,000 mg/L, 42-115 mg/L, and 19-40 mg/L, respectively. The specific characteristics of BioCAST-TER that include four independent biological zones, aerobic, anoxic and anaerobic biological treatment, low sludge production, efficient solid-liquid separation, lower requirement of space compared to conventional technologies, odor-free operation, high tolerance to variations of influent wastewater, stabilization of the generated sludge before its final disposal, and use of less energy and chemicals make this technology very efficient and cost effective for the treatment of wastewater as well as contaminated groundwater and landfill leachate. This technology responds to the current need for a simple, effective and durable method for the treatment of contaminated water. BioCAST-TER responds to the current needs of wastewater treatment and groundwater decontamination markets for a simple, easy to operate, easy to maintain, compact and economical technology that efficiently and simultaneously removes COD/BOD, nitrogen and phosphorus contaminants as well as hazardous organic compounds, and effectively separates solids from liquid, producing a well-treated and clear effluent for safe discharge into the receiving waters. The technology also produces a considerably lower amount of sludge than existing technologies. The treatment of a mixture of contaminants often requires the presence of aerobic, anoxic, and anaerobic environments as well as appropriate sources of carbon, energy and electron acceptors to support the multiplicity of biological processes involved in the removal of these contaminants. BioCAST-TER contains all the necessary environments, and through interactions between the different zones and integration of biochemical processes, provides an internal supply of carbon and energy sources as well as electron acceptors. Examples of mixture of contaminants include carbohydrates and proteins, commonly found in municipal wastewaters and industrial food-processing and slaughterhouse effluents, or hydrocarbons with nitrates and phosphorus, commonly found in groundwater as a result of agriculture and military activities. Other common mixtures of contaminants in the groundwater and landfill leachate include aromatic and aliphatic halogenated hydrocarbons, such as gasoline, jet fuel or diesel fuel combined with tetrachloroethylene (PCE) that require the presence of aerobic and anaerobic environments for their complete treatment..
Apart from the ease of operation and control, and lower requirements of supporting equipment and accessories such as pumps, compressors and recycle lines, BioCAST-TER benefits from a special design that results in considerably lower oxygen requirements and low generation of sludge, two major attributes that contribute to considerable reductions in the operating cost of this technology. The low oxygen requirements stem from anaerobic stabilization of contaminants in the anoxic and anaerobic zones without the need for oxygen. This attribute was demonstrated during the pilot-scale operation of BioCAST-TER that showed reduced levels of oxygen uptake rate (OUR), consistently lower than the theoretical oxygen requirement (TOR) that was estimated from oxygen mass balances of contaminant removal processes. Reduced sludge generation results from the special design and operation principles of this technology that prevent excessive biomass generation. This is due to a number of factors, including high mean cell residence time (MCRT), high concentration of suspended as well as immobilized microbial biomass, degradation of a fraction of organic matter by anaerobic processes, and digestion of sludge in the anaerobic zone. High mean cell residence times up to 138 days were obtained during the pilot-scale operation of this treatment system, producing biomass yields lower than 8.2% (based on the consumed COD), considerably lower than values commonly obtained in aerobic suspended-growth treatment systems. The target markets for BioCAST-TER consist of municipal wastewater treatment as well as industrial and agricultural operations that result in the generation of contaminated effluents. They include slaughterhouses, food processing, dairy industry, animal feedlot, hog waste, pulp and paper, and distilleries. The technology also targets the set of organizations, institutes and companies that are involved in site remediation operations. They include environmental companies, land-owners with groundwater contamination problems, government agencies such as the Ministries of Environment and Transport, transport companies, airports, railroad companies and gas station owners. Groundwater and landfill leachates are often contaminated with a mixture of organic and inorganic contaminants, such as hydrocarbons, nitrates and phosphorus, and will benefit from the treatment by BioCAST-TER, owing to the presence of multiple environmental conditions and biochemical reactions that are needed for the removal of these contaminants. “BIOCAST - NR1: In the field of wastewater treatment, the very high organic and nitrogen loads of wastewaters emerging from industrial and agriculture operations such as animal farms, slaughterhouses, textiles and food-processing factories render conventional treatment processes ineffective."